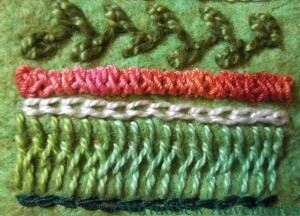 Braid Stitch (number eleven) is another stitch I’m fond of – I used it on the Frolicking Teddies Cot Blanket. 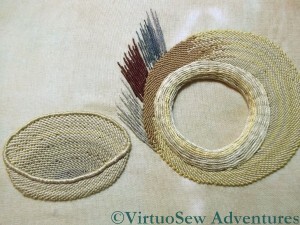 It’s a stitch with a huge personality, so it needs to be used with care, but it’s a good one to have in the repertoire. The thread is another overdyed mercerised round yarn, and because braid stitch uses so much thread, it cycles beautifully through the colours and shows them off very well. 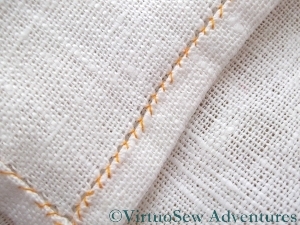 Stitch number twelve is Reverse Chain Stitch. 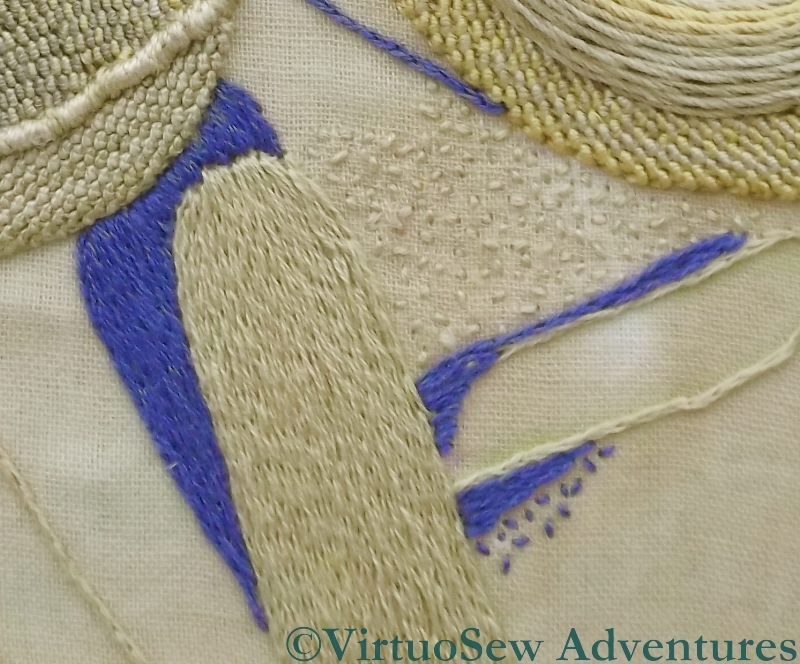 This is a stitch I’d never used before the Goldwork Masterclass, but it is a very useful one, because for some threads it is much easier to work than conventional Chain Stitch. 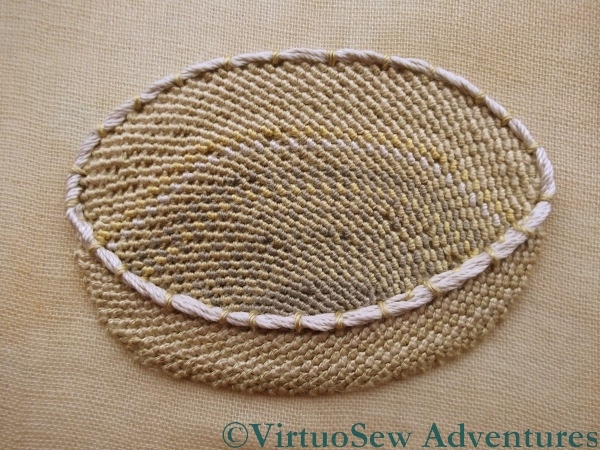 Stitch number thirteen is Cretan Stitch. 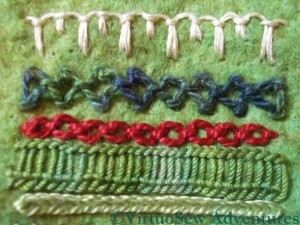 This is a great border stitch, but because the thread I chose – an overdyed soft cotton – was in a green that was rather close to the colour of the felt, I decided to add a row of Chain stitch in a very dark green silk to define the edge. It balances the cream Up and Down Buttonhole Stitch at the other end beautifully. 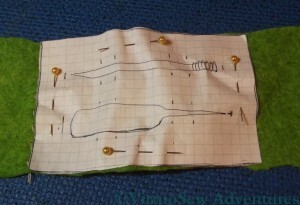 I double checked that I was happy with the layout for the tools by pinning an outline of the two wooden tools onto the felt.Since I used squared paper for the templates it was also very easy to plan where I would place the slits that would allow to tools to be held in place, and to line them up properly. Then all I had to do was to make use of my mother’s buttonhole cutter to cut the slits – straight through the paper template – and reassemble the two layers. That was harder than I expected. I’d forgotten that felt is a very flexible material, and it bent and stretched itself, and needed to be coaxed back into shape, and then pinned firmly back into stability. 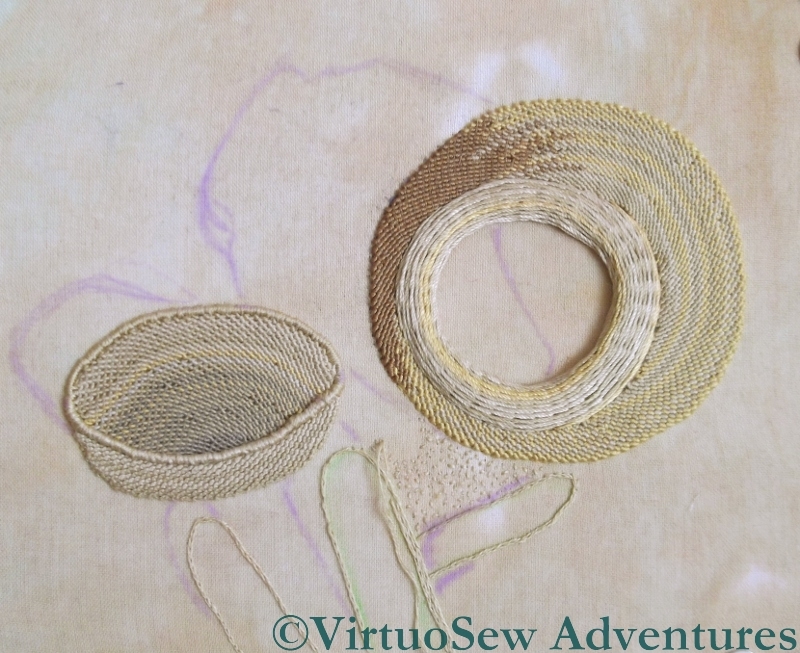 Then I chain stitched down each spine, and blanket stitched around the edge…. 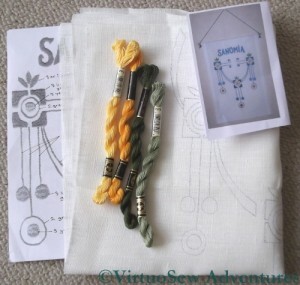 The idea of the sampler section was to give my cousin some inspiration for her own embroidery, and the chance to see what stitches look like in real life, since however good the book or the photo, it doesn’t come close to having the stitch there in front of you in real life! So I decided that it would consist of a sequence of stitches using a variety of threads. Naturally, I included some of my own favourite stitches! 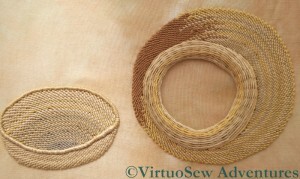 Here, the top one is Up and Down Buttonhole Stitch, using a stranded linen thread from DMC. I first used this stitch in the Persian Fantasy, and I’ve loved it ever since. In this case I’ve added to the ornamental effect by alternating long and short upright stitches. 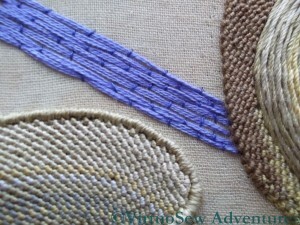 The next is Diamond Stitch, using an over dyed pearl cotton from Stef Francis. 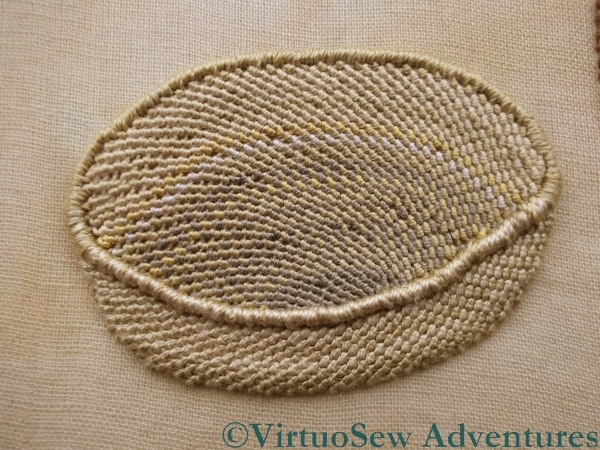 This is a stitch I’ve never used before but often wanted to. I’ll use it again, I’m sure – it was rather fun! The third – in standard Anchor pearl cotton – is Cable Chain Stitch, which is my favourite chain stitch variation. It isn’t always suitable, because it is a stitch with a very strong character, and sometimes something more subtle is needed, but I always enjoy stitching it. 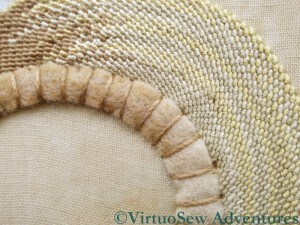 The fourth is Ladder Stitch, which I struggled with so much on the Tudor and Stuart Goldwork Masterclass course. 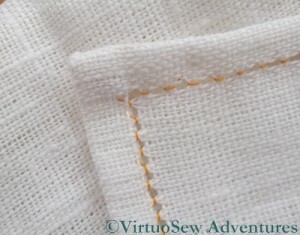 Here I have used an overdyed soft cotton (Stef Francis again) and found it so much easier to do! 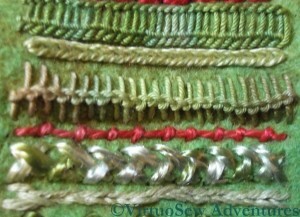 The fifth is Heavy Chain Stitch, which I have found very useful a number of times. It produces a smooth, clean line, definition without texture, which can be hard to achieve in embroidery, which after all is a very textural form of expression! 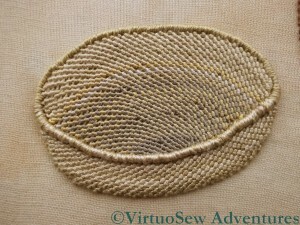 The first new stitch in this photo (sixth in the sampler panel) is Loop Stitch, this one in a round mercerised cotton. It’s another stitch I’ve not often used, but it provides a great contrast in texture with the Heavy Chain Stitch above it. Stitch number seven is Coral Stitch (remember I used it for the little girl’s hair in the Holiday Traycloth?). I used another overdyed pearl cotton – one of my favourite threads, because it brings stitches to life. 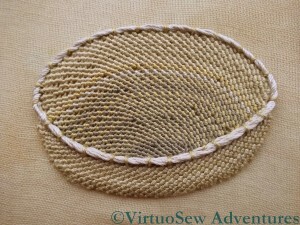 Closed Herringbone Stitch is next, using an almost untwisted rayon thread. This produces a dense plaited effect – very glossy and dramatic. The final row in this second photograph, number nine in the sequence, is a combination of Stem Stitch set beside Outline Stitch. 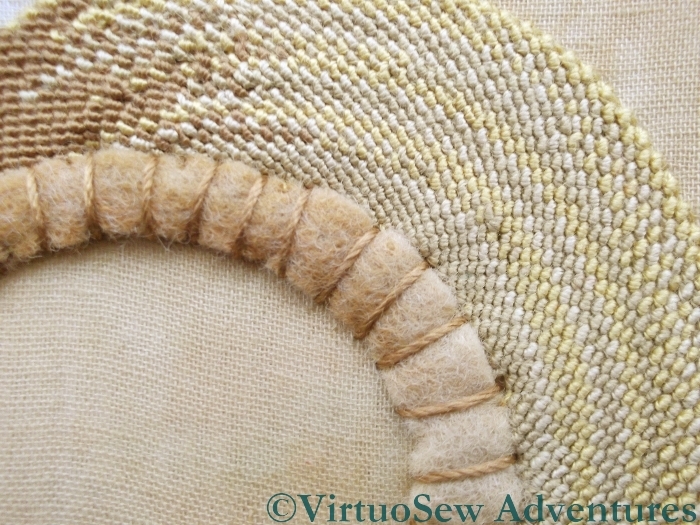 I know it looks a lot like chain stitch, but the two stitches are mirror images of one another! Since Christmas is over and the present duly received, I can at last show you the present I made for my cousin. She’s become interested in embroidery, and when I saw some hand made, beautifully-finished wooden tools (a mellor and a stiletto) at the Knitting and Stitching Show in Harrogate, I decided that I would give them to her for Christmas. That was all well and good, but I couldn’t think of a suitable way to present them, so I decided to make a case for them. I spent some time sat in the picnic area at the show, sketching different possibilities and trying to work out what other supplies I needed to buy, and when, between mid-November and Christmas Day, I would be able to make it since I was still suffering from tennis elbow (I still am, but not nearly as much!). I was beginning to threaten to put together a kit and giving her that when one of the other ladies at the table pointed out that I would still need to make one as a proof of concept (a phrase I never expected to hear at the Knitting and Stitching Show!). She was right, because it evolved considerably in the process! In the end I decided to make a case with three panels, using two layers of felt. I drew out paper patterns for each panel, and pinned them on to the piece of felt I had decided to use. I had considered putting a panel of canvaswork stitches on the front – I even bought a piece of congress cloth to use – but then decided that since she is interested in embroidery, it should be a panel of embroidery stitches. As you can see, I also had second thoughts about the size of the sampler panel, and made it slightly smaller. That meant that there would be a wider border around the panel – always an improvement! 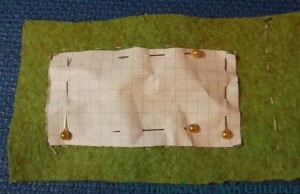 I ran tacking stitches around all the design elements to make sure I knew what was where, and then started thinking about the stitches to use for the sampler panel. There’s been a frustrating hiatus in my stitching life of late – I’ve had tennis elbow, and have had to write up old embroidery projects for you instead of making progress on any of my current ones. I’ve been going stark, staring mad with frustration, because even holding a book has been painful. However, I’m beginning to get back to it at last. Cautiously, so there will still be older projects interspersed with the current ones! I’ve been doing a few stitches here and there while I’ve been trying to rest the elbow, as much as anything else to gauge my recovery (or lack of it, as it sometimes seemed!). So now you can see that I’ve nearly outlined all the shadows. There’s just the shadow inside the pot to deal with and it occurs to me that I might need to find some tarnished purl to create the effect of the shadow on the metal inside! 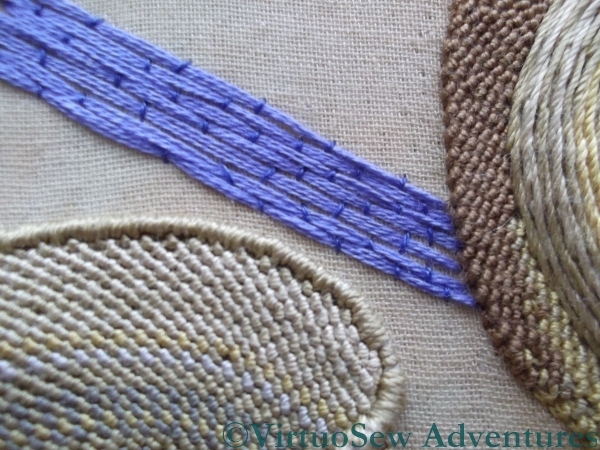 I’ve also made a start on the sandy effect seed stitches, in a small section between the pot and the sticks. That’s going to challenge my boredom threshold, even though I don’t intend to have the seed stitches all over the background! This close up shows that I’ve also managed to fill in the first of the sticks, using split stitch filling. I need to add some highlights later, because as it stands it’s a little flat. Still, it’s great to be back! Crock of Gold Hoard – Those Wretched Shadows! When you last saw the Crock of Gold Hoard (here), it included some highly unsatisfactory shadows, and my mother and myself had pounding headaches and crossed eyes from deciphering the original photograph. It took several hours of frustrating, painstaking unpicking, aided by tweezers, but I managed, and then started on the ground while I pondered the shadows. There are some sticks or something on the ground, and I want the ground to look sandy and speckled so I’m going to use seed stitches to create the sandy, gravelly look. This example isn’t quite right – the shadow of the pot isn’t long enough, but it does demonstrate quite clearly that I’ve decided to simplify the shadows very considerably. Since I’m removing the archaelogist and his hands, as well as the confusing shadow of the post which is out of the picture, I’ve decided I might as well simplify as many of the other shapes as I can. As I’ve said before, I’m not a needlepainter, and I’m not aiming for complete realism. Still, getting the shadows right will do much to make the design seem realistic enough. I’m sure the detail of the shadows will change, but I’ve now drawn in an outline of those simplified shadows in chalk. I’ve even remembered that the pot has shoulders and a raised rim. I mentioned in my last post that I was somewhat troubled by the question of the shadows that I need to have in this picture to “anchor” the Crock and its lid in space. Since the silk I used for the Crock has a sheen, my original idea was to try to find a matte thread to help keep the shadows in the background. 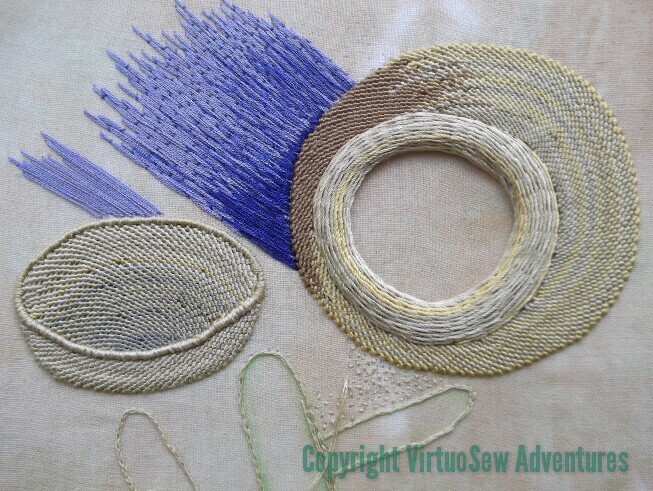 I had three dark, “shadowy” colours in a linen thread, and tried those first. I wasn’t happy either with the colours (too dull and drab for shadows cast by an Egyptian sun) or the texture (rough and scratchy), so I tried a soft lilac-y blue stranded cotton, couched down with a darker blue. That was better, but not really dark enough. So this on the left was my next attempt. I like the shading effect and depth of colour that I’ve managed to achieve, but I can already tell that the shape of the shadow is absolutely wrong. So I packed it up, and took my problems to my mother, who is an artist, and has a much more practised analytical eye than I have. At which point, we realised that the shadows were rather more difficult even than I’d thought. A lot more difficult! The amber arrows indicate (approximately) what appear to be two conflicting light sources. 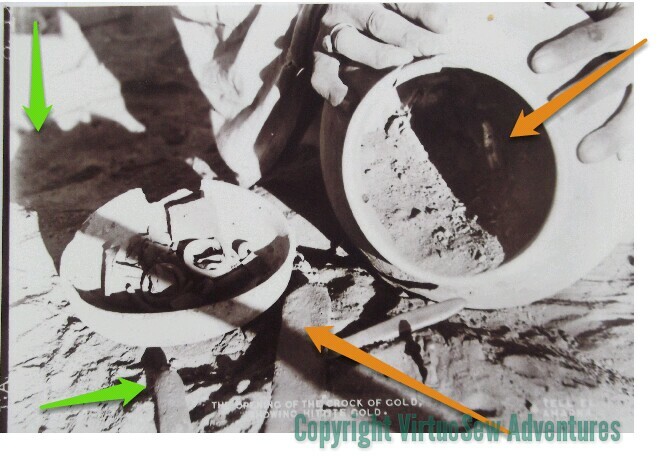 Since the ground appears to be uneven, this must be a photo taken on site during the excavation. The vertical green arrow in the top left corner is pointing at a shadow which is clearly of something on top of a pole somewhere out of the picture. The other green arrow points to shadows show that the ground underneath the lid isn’t as even as a careless glance would at first suggest. I’ve got a lot of unpicking to do! 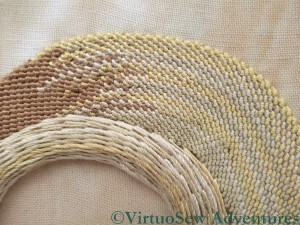 After much cogitation, I decided to work stem stitch band around the rim of the Crock of Gold. It seemed to me that that this might create the right combination of a rounded shape and a smooth line around the rim. 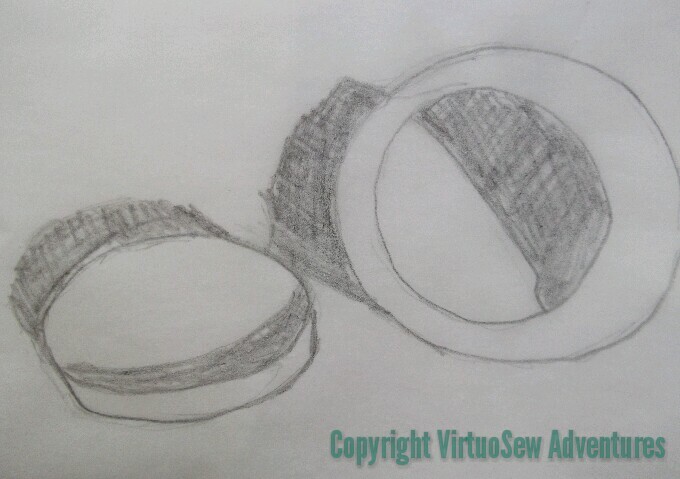 Although satin stitch worked beautifully for the much narrower rim of the lid, I was sure that it would lead the eye wrongly in this case. In fact if you look at the foundation stitches for the stem stitch band, I think that confirms my suspicion. The choice of stitch also meant that by changing colours as I worked the stem stitch over the foundation, I could keep the sense of movement that I feel recalls a hand-made pot. Had I worked the rim in satin stitches, changing colours would have created a rather blocky effect – fine when I come to re-create some of the geometric patterns the Egyptians used, not so good for a plain and undecorated earthenware pot! 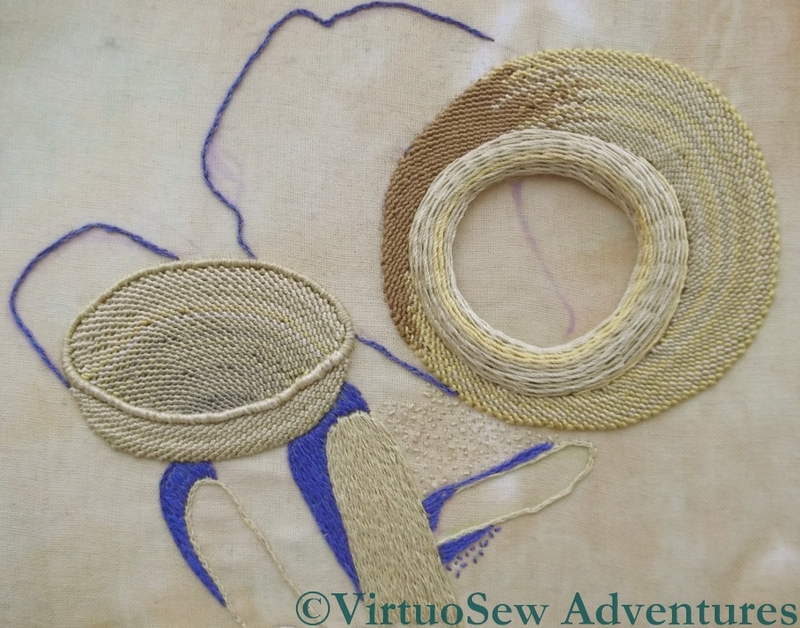 I had a momentary wobble as I began to work the rows as the stitches seemed not to be packing together, and I kept catching my needle on the felt, but gradually as I added more rows of stitching I realised that it was working. Now I have the rims done, I need to do the shadows, and I’ve not quite worked out how, as yet. Still, thus far, the Crock of Gold is working pretty well. I think the raised effect of the rims will help to keep the chipwork visually contained, and that will be important, as there’s the potential for chipwork to draw the eye too much. 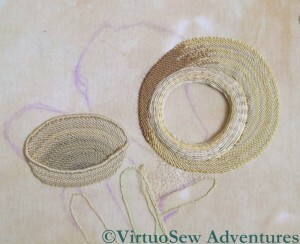 While continuing to work the eccentric spiral trellis stitch for the lid, I’ve been thinking about the rims. Before I move on, though, this picture shows how I’ve tried to introduce darker colours inside the lid to create an impression that it is hollow. I think it’s worked, too! It’s clear that I’m not going to be able to use the same techniques for both rims, since one is so much wider than the other. 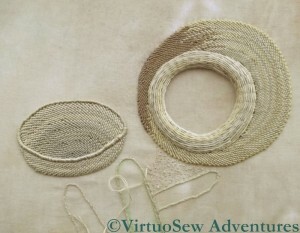 I used felt for the rim of the crock itself, and four lengths of silk thread twisted together to put some padding on the lid rim. As much as anything else, this is to create a visual sense of depth when I put in the chipwork. Even without the padding covered, this works pretty well. However, with the padding covered with satin stitch, it looks altogether better. Working the satin stitch was something of a trial, because I have a layer of calico, a layer of turban cotton, and then the edge of the trellis stitch to deal with. I’ve varied the colours around the rim to create some sense of depth and highlight. I’ve realised while I’ve been working on this that the next serious challenge on this piece is going to be working out how to put the shadows in. As it stands, it is interesting, but not visually satisfying, because the crock and the lid seem to be floating in mid-air. They need to be brought back to earth, preferably without a crash! A few weeks ago, my husband the Australian was speaking at a conference in Turku, Finland, and the organisers were kind enough to allow me to go too. We had a marvellous time – the Finns are terrifyingly good linguists, so we had no language problems, and because the conference was about Science and Art, and how they feed off one another and contribute to one another, the conversations were very wide-ranging, full of sparkle and fun. I didn’t have much time for side trips, but I did find an embroidery shop, and asked about local rural Finnish embroidery. I picked a design I liked the look of, and they agreed to prepare a tracing for me and send it on. It seems to be in a combination of stem stitch and Bokhara couching, but when I’ve had a closer look at the stitch diagrams, I will be able to tell you more. You also asked for some information about the pattern, we have a book that tells a brief history of where the pattern was found. Of course, the original designer of the pattern is impossible to trace. The pattern was originally embroidered on a bag or pouch, that was hanged on the wall, where people put smaller newspapers and magazines into. That’s why the pattern is called ”Sanomia”, it means messages or news in finnish. The word was also embroidered in the bag. We copied the model ourselves to other products, such as runners. The ”Sanomia”-newspaper bag was found in the Kankaristo house, in country village of Mynämäki. The bag, that was found there, was sewn by the lady of the house, Helli Kankaristo, born in 1902. The story tells that she was taught to make embroideries by her very skillful teacher at school, and Helli passed her skills also to daughter Inkeri, born in 1928. The Finnish Table Runner is Finished! 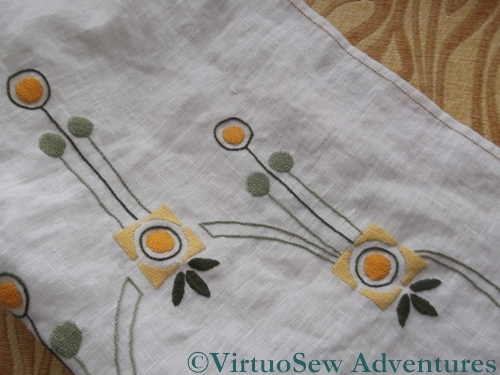 At long last… I have finished the Finnish Table Runner! The embroidery itself is very simple – Bokhara Couching and Stem Stitch, with the darkest leaves worked in nested Fly Stitches. I used two shades each of two colours – a greyish green, and a golden yellow. The couching stitches of the Bokhara Couching are carefully arranged to create a basketweave effect, and I worked harder than usual to make the stem stitch regular with an even twist to it. Real simplicity is hard work, because the simpler the tools and effects you are using, the better-executed they have to be! So I have taken particular care to stitch evenly. This was not entirely straightforward, in fact, as the fabric is a plain weave (one thread over and one thread under in each direction) but is not a square weave (warp and weft threads equally spaced). Since it is also a linen, and the threads are a little slubby, sometimes the effect is exaggerated. This became especially clear when I worked the hems. Incidentally, I’ve no objections at all to the fabric not being a square weave or to the threads being slubby – these are just factors that sometimes influence how something is worked or the effects that are achievable. When I hemmed the piece, I chose to use Antique Hemstitch (at least, that is what it is called in Yvette Stanton’s Right Handed Embroiderer’s Companion). This leaves only a small stitch on the front of the piece. I withdrew a single thread for each hem (the instructions usually suggest at least two, but I wanted a narrow line down the edge and not the dogtooth effect of hemstith on only one side of the withdrawn threads), and then grouped four threads in each stitch. 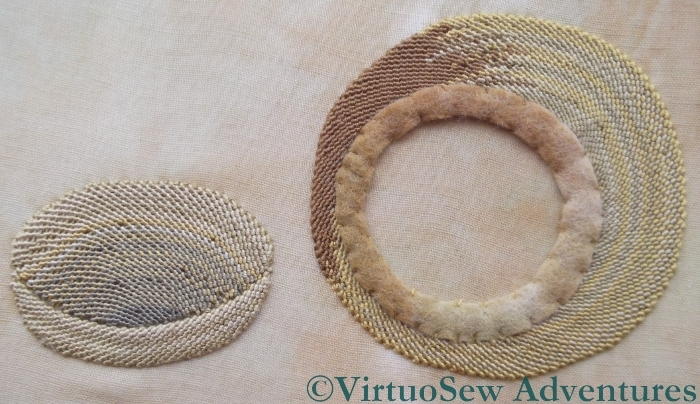 If you look hard at the photos, you will see that in one direction the stitches look longer than the other, although they group four threads in each case. Since the table runner is about a metre and a half long, and nearly half a metre wide, that’s about four metres of hemming, which for some strange reason I enjoyed enormously, even though I’m really not good with repetition. 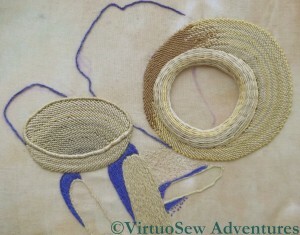 I used ordinary sewing thread, but decided to use a golden yellow to add a bit of colour along the edges. When my mother saw it first (half-done), she told be I was being a little show-off, but I think she meant it as a compliment!